In Medias Res, Latin for “into the middle of things,” conveys an in-between period, an in-between region, whether literal or philosophical, between reality and the remembered, chance and the predetermined, abstract and the imagined. 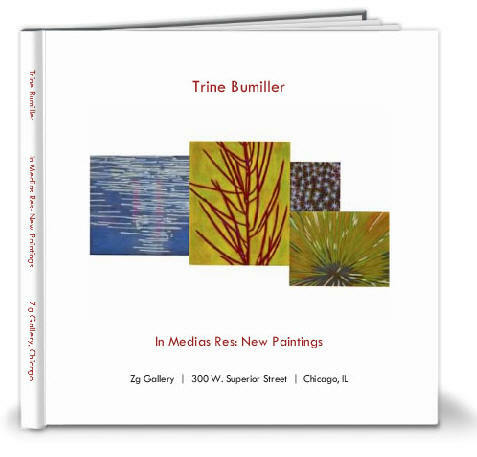 “I’ve been working with the organic and inorganic and finding that combination in the middle of things that is representational and abstract,” Trine Bumiller says. Bumiller creates her paintings on wood panels, combined together like building blocks, to create a composite form of square and rectangular shapes that look backward and forward. The concept was influenced by a year Bumiller spent in Italy viewing altar paintings and predellas, which combine imagery in rectangular shapes to tell a story. On each Bumiller panel, a different organic, flat, geometric element suggests nature or botany. The artist thoughtfully manipulates color, preferring unnatural combinations, such as hot pink and yellow, orange with acid green or lilac contrasted with earth tones. The lines, shapes and layers of her painting technique hearken back to her training as a printmaker. Using a method known as glazing, each work is created by building up as many as fifty layers of thin oil paint. Bumiller works on tables, with the panels lying flat, allowing the liquid pigment to pool and coalesce. It’s a slow process. One layer a day. And as the layers of glaze are building, so are the cognitive connections. “My process of painting in multiple transparent glazes and building up the form slowly correlates with timelessness and the core issues of life and existence,” she adds. Viewing Bumiller’s paintings, her interest in science is evident. She explores imagery that is similar yet diverse: spiraling stems developing on a plant could represent the Milky Way, a rippled pool of water might be a recent galaxy discovered by the Hubble telescope. Less evident is her exploration of memory and the environment as repository. “Our memories are part of the landscape and yet we don’t see it,” she says. In this way, her paintings are a bit like Ross Bleckner’s memento mori. And with her use of organic and abstract it’s easy to think of Bumiller as a more restrained Judy Pfaff. Symmetrical yet random, ordered but disordered, microscopic and macroscopic, Bumiller’s works employ the concrete medium of paint in such a way as to address the mysteries of the universe, and to find the edge where the individual meets the universal.